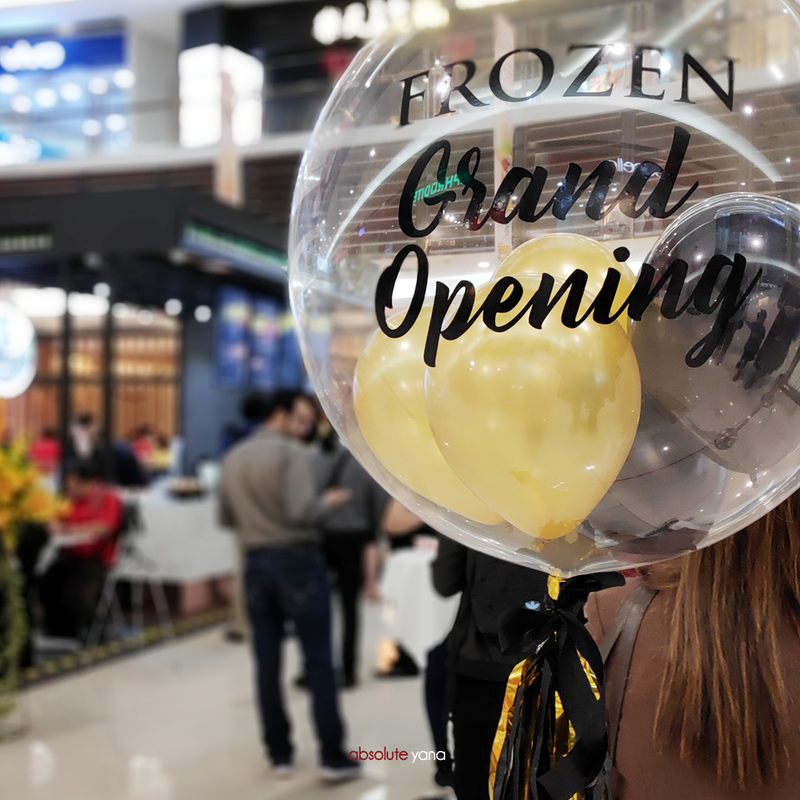 If you have a sweet tooth or someone who just simply enjoy desserts, then you should be bouncing off the walls with the latest grand opening of Frozen at Paradigm Mall, Kelana Jaya. 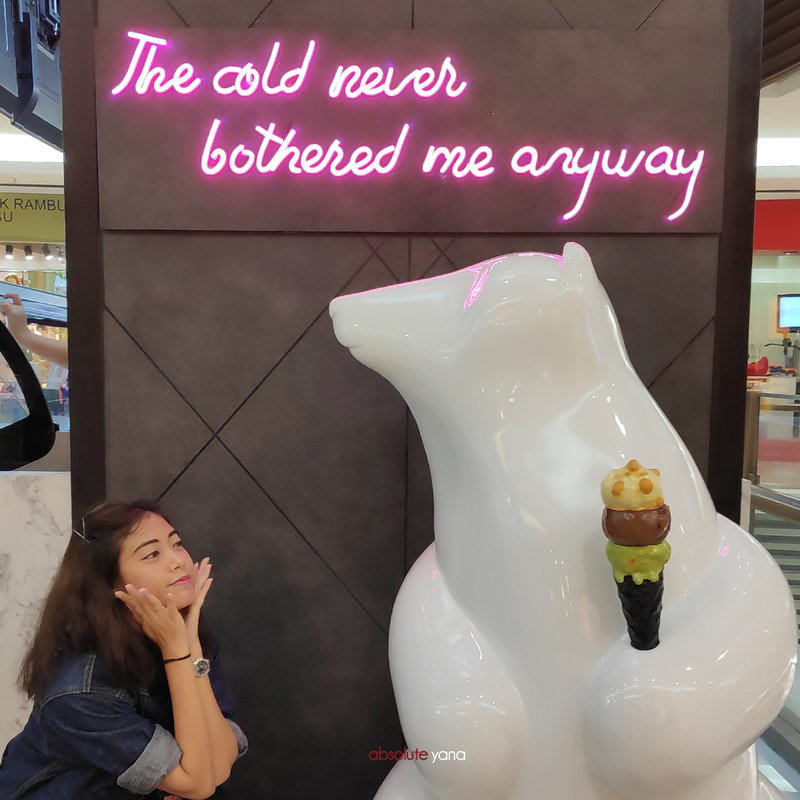 About two weeks ago, I had the opportunity to pay a visit to Princess Elsa's world of ice cream wonders and found my (possibly) top favourite ice cream of all time; the Golden Crunch. It was almost like finding treasure under the frosted floor because that wasn't even the ice cream flavour that I wanted to try. Initially, I took the Dragon Fruit and Mango Cheesecake flavour...but I fell in love hard with the Golden Crunch; all thanks to Joanne, who scooped that flavour to try. From my personal point of view and taste bud preference, the Dragon Fruit tastes exactly like the fruit itself. Just imagine putting a whole Dragon Fruit into the freezer and leaving overnight, only to scoop it up and enjoy the next morning. As for the Mango Cheesecake flavour, I wish to say it was amazing, but I felt like the Mango was too heavy, killing the taste of the Cheesecake. I personally only enjoy eating Mango in its true form and not in any other forms. At first, I didn't even realise that it had mango in it till after I had tasted it. I was purely attracted to it because the label read Cheesecake. But that all didn't matter, when I took a mini scoop of the Golden Crunch and I couldn't stop myself from licking the spoon till the very end. Crunchy salted caramel with a little roasted taste in it gave the ice cream much definition in taste and texture. 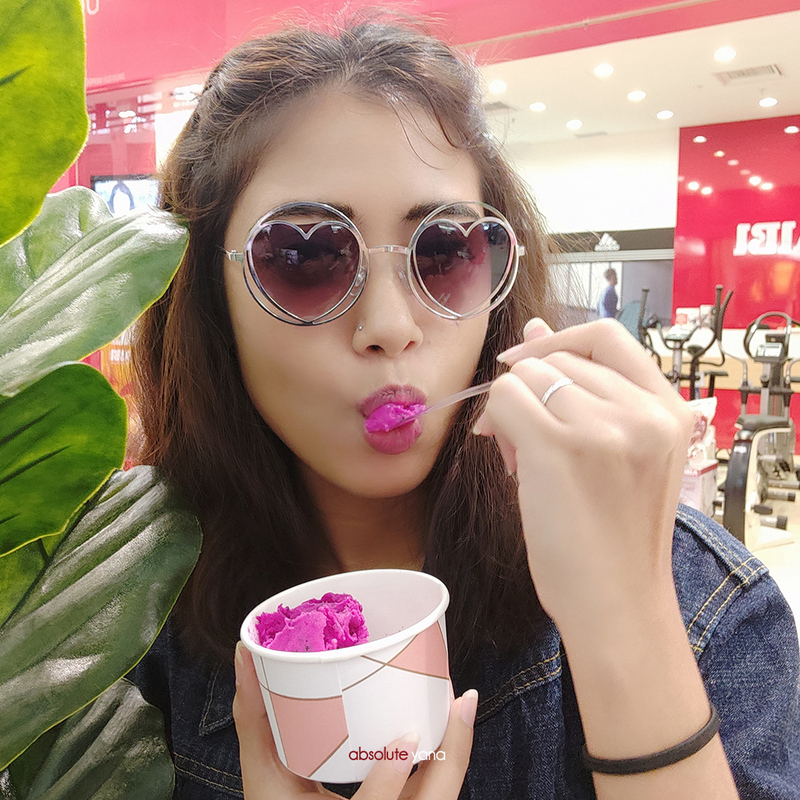 Although it isn't their signature ice cream, I would still recommend it for you to try! One of their signatures is the Kuih Talam, a local favourite dessert among Malaysians, and it is worthy of being their signature! I really can't put it into words of how good this Frozen Kuih Talam ice cream is...but just know that many who ate it, kept going for seconds. I will be heading over there soon again, to try other flavours that are available. So, rest assured that there will be updates on this post. To make sure that you do not miss out on the update, please do subscribe to my newsletter! I am back! 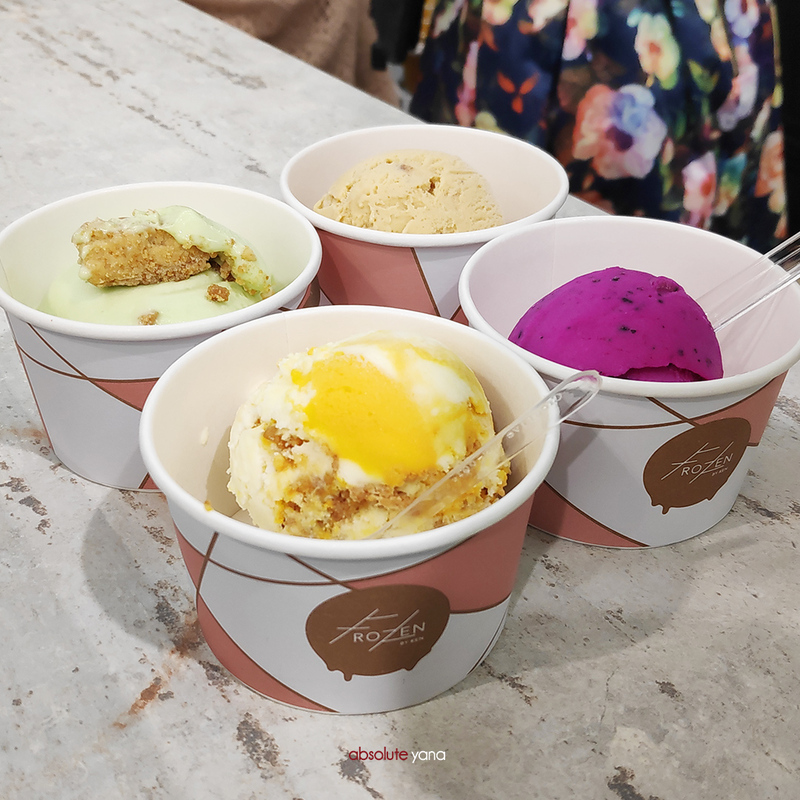 As mentioned above, I did head over again to Frozen @ Paradigm Mall, Kelana Jaya and got to taste 3 more new flavours; which I had fallen hard for one more flavour! I just couldn't resist my all-time-favourite Golden Crunch, so I was greedy enough to order it again alongside with Frozen's Musang King, Cookie & Cream Chip and Raspberry Sorbet. The other ice cream flavour that I fell in love hard with is their Musang King, it's a must for those who love durians! No joke, it tastes exactly like the real deal! It even has the creamy texture of the fruit itself which makes it all the more delicious. For my next visit to Frozen, I am planning to get 1 tub of it; for RM39.90 per tub, I feel like it is super worth it. The next which got me questioning my gluttony, is the Cookie & Cream Chip. It really tastes like bits of Orea biscuits. 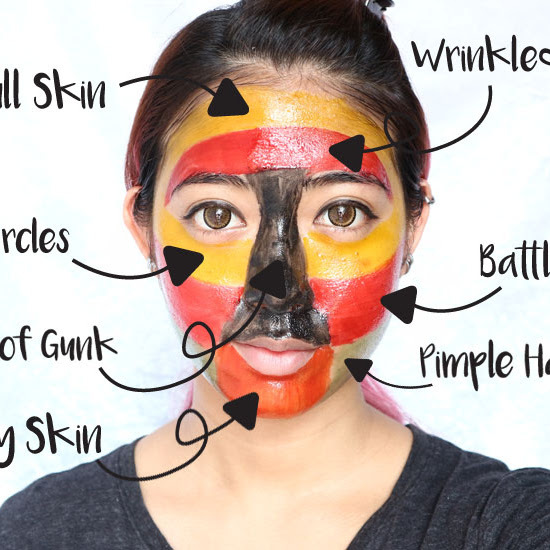 If you like Oreo then you might really like this one. But of course, if you'd ask me to pick between the Cookie & Cream Chip and Golden Crunch, my vote will definitely go to the Golden Crunch. Since, it was a week after their grand opening, I managed to snap a picture of how their outlet looks like. 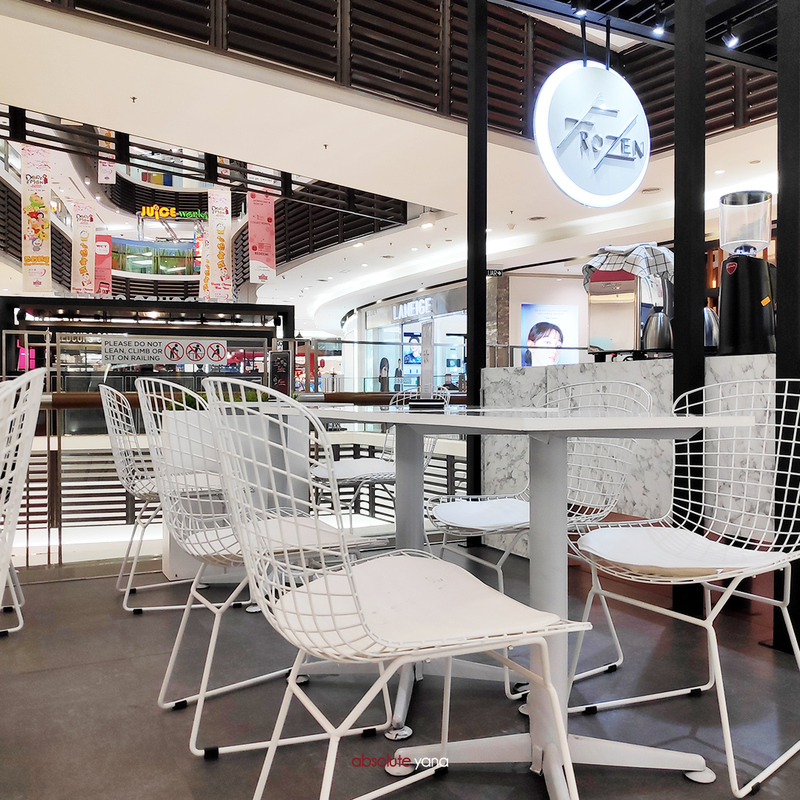 It's a very nice place to sit down for spoons of ice cream delight, a catch up with friends and also a quiet place to enjoy a chapter or two of your favourite book. That's what I did for my second visit. Oh! 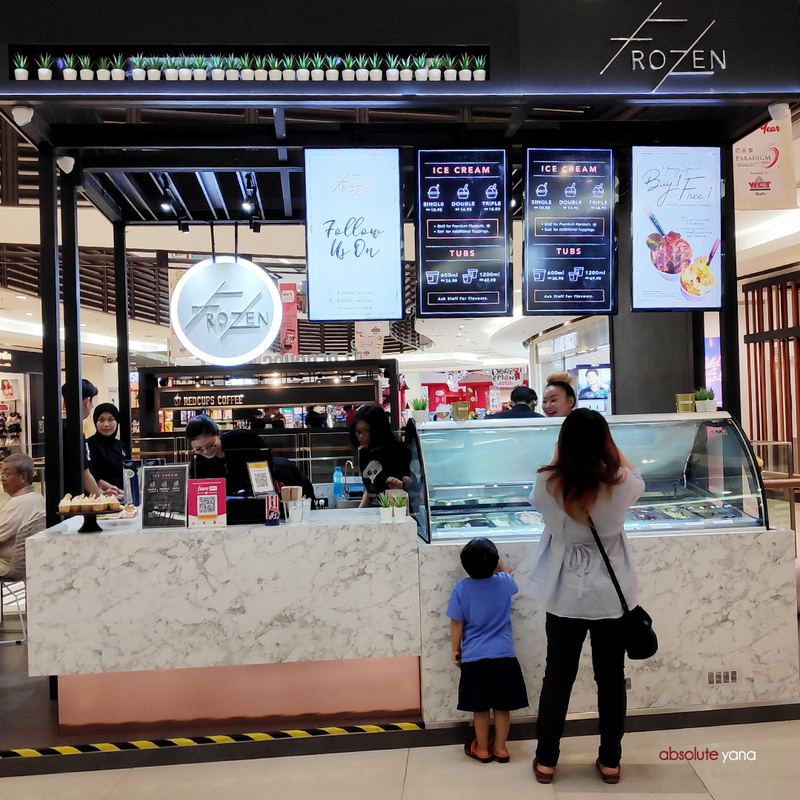 And before I forget, I was informed that the Frozen @ Bangsar Jalan Telawi has more flavours than the flavours that are served at this outlet. 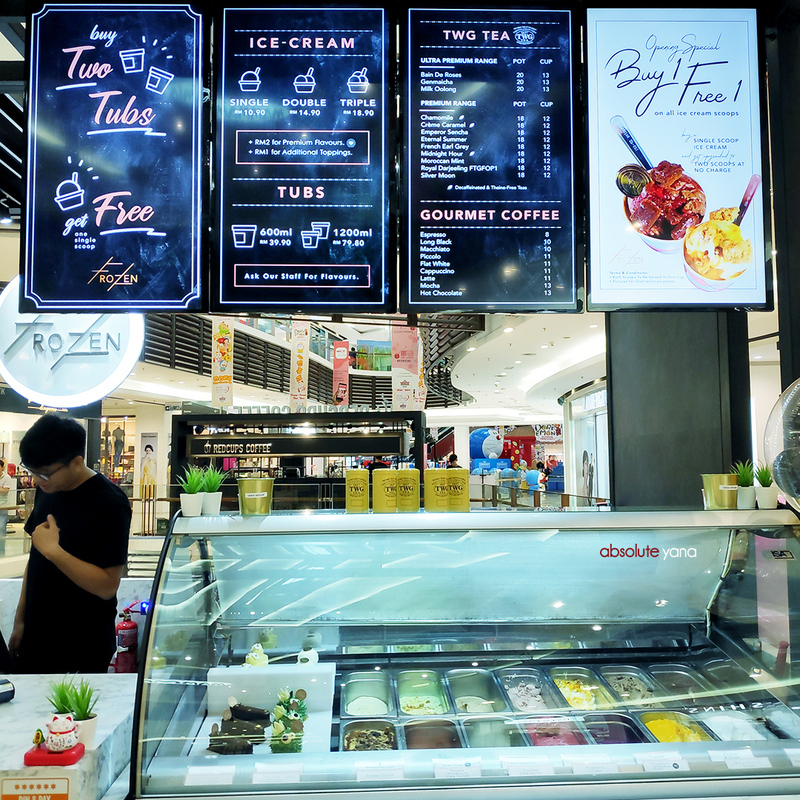 So, maybe for those who find it more convenient to enjoy a cup of ice cream in Bangsar, you may want to opt for that outlet instead. That's it for my update, hope you will fall in love with their hand-made ice creams as much as I did. 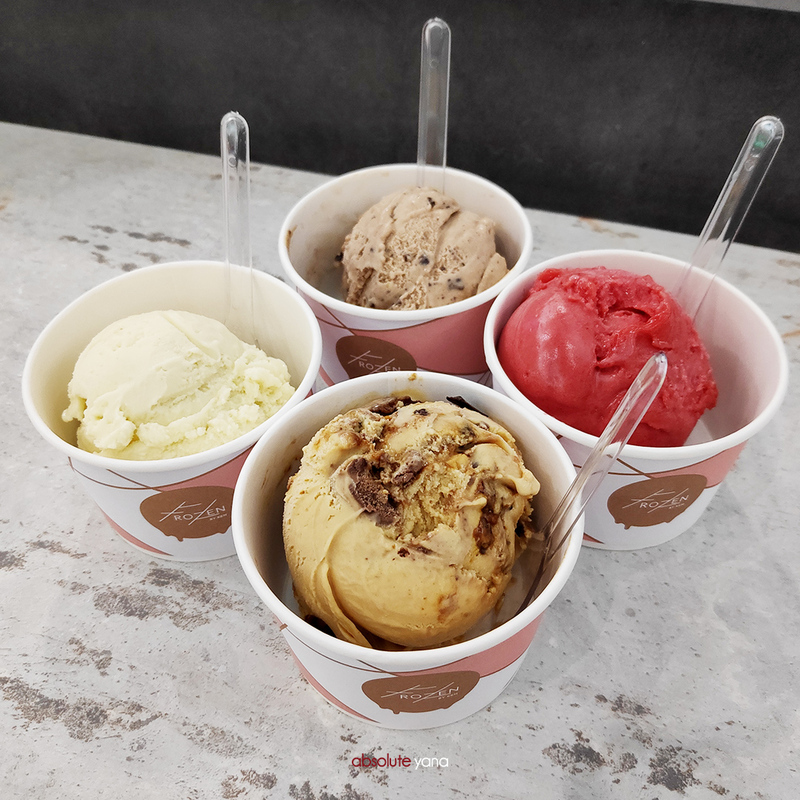 Enjoy each scoop!